EORTC, ISCL, and USCLC consensus recommendations for the treatment of primary cutaneous CD30-positive lymphoproliferative disorders. Kempf W, Pfaltz K, Vermeer MH, Cozzio A, Ortiz-Romero PL, Bagot M, Olsen E, Kim YH, et al. Olsen EA, Whittaker S, Kim YH, Duvic M, Prince HM, Lessin SR, Wood GS, Willemze R, et al. J Clin Oncol. 2011, 29: 2598-2607. 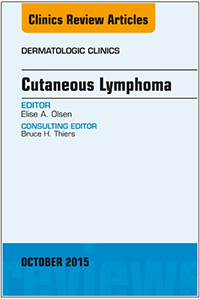 Sézary syndrome: immunopathogenesis, literature review of therapeutic options, and recommendations for therapy by the United States Cutaneous Lymphoma Consortium (USCLC). Olsen EA, Rook AH, Zic J, Kim Y, Porcu P, Querfeld C, Wood G, Demierre MF, et al. J Am Acad Dermatol. 2011, 64: 352-404. Review. Kim YH, Willemze R, Pimpinelli N, Whittaker S, Olsen EA, Ranki A, Dummer R, Hoppe RT. Revisions to the staging and classification of mycosis fungoides and Sezary syndrome: a proposal of the ISCL and the cutaneous lymphoma task force of the EORTC. Olsen E, Vonderheid E, Pimpinelli N, Willemze R, Kim Y, Knobler R, Zackheim H, Duvic M, et al. Lessin S.R. and Porcu P.
Markova A. and Weinstock M.A. Hodak E. and Friedman E.
What Can Psoriasis Teach Us About the Genetic Basis of Cutaneous T-Cell Lymphoma? Bunn, Jr. P.A. and Pacheco T.
Zain J. and O'Connor O.A. Rook A.H., Benoit B., Kim E.J., Vittorio C., Anshelevich A., Raphael B.A., Introcaso C.E., Gardner J.M. et al.